The Low Down: What if you grew up knowing that your kiss would one day cause the death of your true love? This was no idle threat from an overbearing father, mind you, for Blue Sargent has no father. When you come from a family of clairvoyants and psychics, you tend to believe them when they make predictions such as this. Blue doesn’t see ghosts and can’t read Tarot cards, but her gift is valuable. Her talent is in amplifying the abilities of those around her.Every year on St.Mark’s eve, Blue and her mother, Maura, go to the churchyard that is on the old corpse road to see who will die that year. This year, though, is the year two things changed: Neeve, Maura’s half-sister goes instead of Maura; but, more disturbingly, Blue sees a ghost. She speaks with him, learns his name (Gansey), and determines that he attends the local rich-boy boarding school, Aglionby Academy. Blue has made it her policy to stay away from boys in general, but especially those there. They are known as the Raven Boys because of the school crest they wear.Gansey is a student at Aglionby, and though his family is indeed filthy rich, his reason for attending the esteemed Academy has less to do with education and rubbing elbows with his wealthy peers than finding the ley line and where it leads. Out in a church parking lot the same St. Mark’s eve, Gansey sees and hears nothing. However, his tape recorder tells a different story. He hears his voice answering questions…and a girl’s voice asking them.Soon their paths cross, and Blue also meets Gansey’s friends Adam (the scholarship local), Ronan (the angry one) and Noah (the quiet one). When they join forces, it leads them to a mystery, a killer, loss, brutality, burial and rebirth. Best Thang ‘Bout It: The writing just pulls you in, gently. After the shortest of whiles, you don’t even realize you are reading. It’s like hiding in a tree where you know there’s life beyond its canopy, but you are cocooned inside and no one can see you or disturb your world. I love fantasy where it really might, really could be possible; the lines here are not really that far-fetched or invented. My words cannot do the author’s words justice. The interconnecting stories come together very nicely. I don’t try to solve mysteries ahead of time (I like for them to unfold), but sometimes things are so obvious as to be obnoxious. Like, “Hello! Here’s a clue! Over here!” This story was not that way, though if you are one who likes to figure things out ahead of time, it probably wouldn’t be super difficult here. I’m Cranky Because: I’m not really cranky about it, per se, but I can’t tell you what I was, let’s say, confused about, because it would be a major spoiler. Should You? : If this is a genre that you like to read, and especially if you enjoyed the author’s writing in her wolf series that started with Shiver, you will love this book (beware that it is not the same type of book as Shiver, though). Emphatic yes. I cannot express any better how lovely the writing is in The Raven Boys. 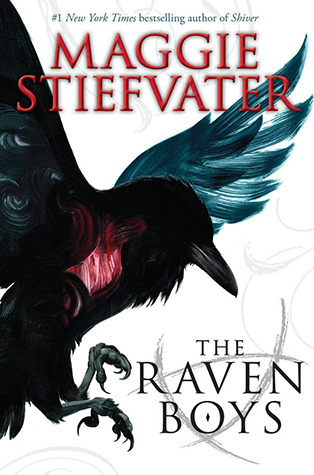 The Raven Boys by Maggie Stiefvater was published on September 18, 2012 by Scholastic Press. You Might Want to Know: Profanity and underage drinking. I have yet to read Raven Boys but I have read the Shiver trilogy and Scorpio Races. Shiver was pretty good and I loved Scorpio Races but I just wasn’t sure about this new book she wrote. After reading your review I think I am going to go ahead and give a try! I will read Scorpio races since you liked it. I loved Shiver, but thought that the last one was seriously lacking, like she’d already moved on mentally. She’s such an evocative writer, I am glad I read TRB. Do let me know what you think about it. Thanks for following and thanks for the comment!